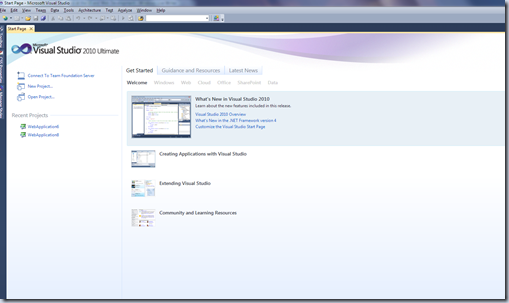 Visual Studio 2010 Beta 2 is out and has a slick new UI. Also, this Beta has most of the features that would ship with the final version compared to the earlier Beta. Note that while new features might be added, there are chances that some of the features demonstrated here may also not be a part of the final release. But, for now, lets examine the current Beta 2. The first thing you would notice and probably like, is the UI enhancements. Herebelow, is the launch screen. Also, the start page has been modified to accommodate more useful things. 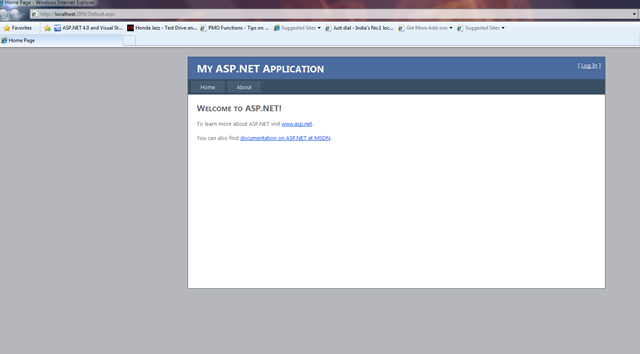 The good thing is that you can completely customize the Start Page since it is a XAML based UI. You can find the start page itself as a Project at C:\Program Files\Microsoft Visual Studio 10.0\Common7\IDE\StartPages once you install the Beta. You can change it to reflect your organization specific templates, document repositories etc., Optionally you can even turn it off permanently, or, upon opening a project, using the checkbox options in the bottom left. Other thing to notice is that, by default jQuery 1.3.2 library is included in the Scripts folder, not to mention, the intellisense support for jQuery that has been there right from VS 2008 SP1. There you had to manually install the docs as well as the jQuery library. Now, it all comes automatically. You can download Visual Studio 2010 Beta 2 from http://www.microsoft.com/visualstudio/en-us/products/2010/default.mspx or if you are an MSDN Subscriber from the MSDN Download Center. 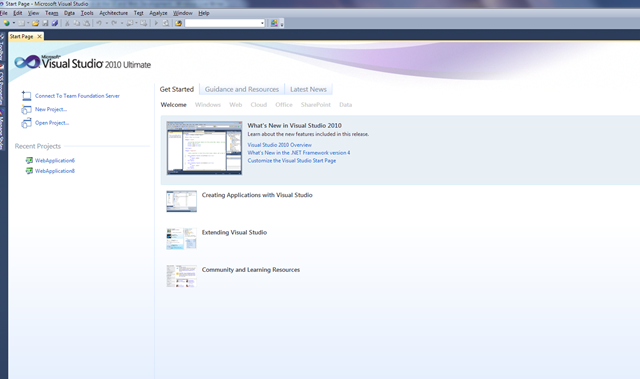 Its very very intersting .It would be nice if you can give us some meeting explaining highlights of VS10. The UI looks quite impressive, very excited to start using it. Thank you for this review. It looks interesting. The customizable start page sounds quite comfortable in my opinion. Really kool article on VS 2010. The splash screen itself grabbed my heart. First impression created the best impression on it. 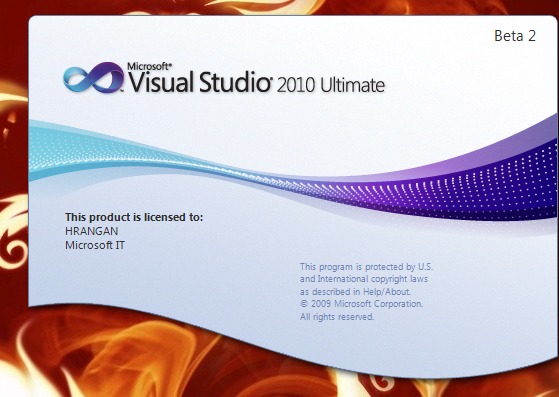 That UI of VS 2010 looks sophisticated. The loading screen is fantastic. I'm very excited to upgrade soon. Thanks for sharing this valuable knowledge here.. In fact many of the actual web enhancements are figuring in this Beta release and exploring them would require individual blog posts that I would be writing in future. Hello!Thank you for the information. 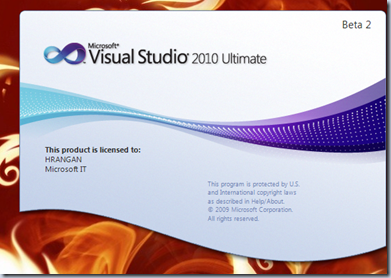 does visual studio 2010 ultimate contain sql server 2008 ? Was really a very informative post, keep up the good work. .It would be nice if you can give us some meeting explaining highlights of VS10.